Love these pillows!! Not too firm, not too soft...perfect medium support. This is my second set to order. Highly recommend this pillow to all!! 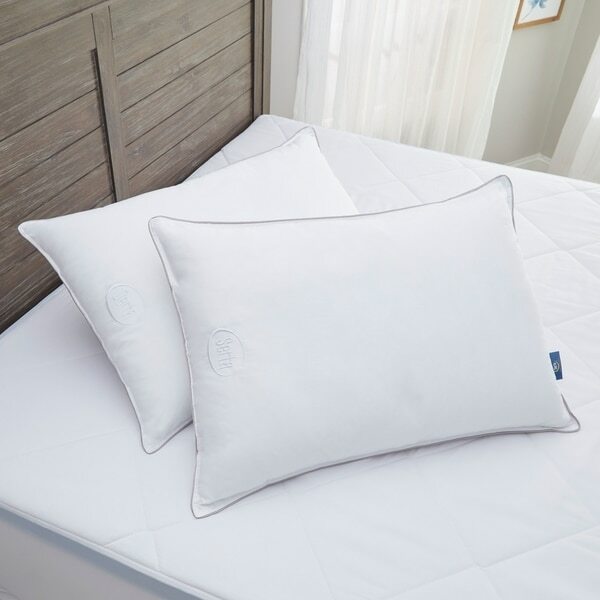 Serta Down Illusion Pillow 2 Pack - Down Like Luxury Filling is refluffable and scrumptuosly comfortable. Nicely appointed with satin cording and 233 thread count cotton woven fabric. All the comfort you expect from Serta. Easy machine care. Way too soft, no support at all. I have to use both pillows and my old pillow. I would not buy this product again. Once you put your head on it, the whole thing goes flat. I do not recommend this pillow. Love these pillows. Accepts my head and doesn't push it back.